Jan Pauwel Gillemans (1618-1675) the Elder was the son of a goldsmith; he was born and resided all his life in Antwerp. He was most likely in contact with Jan Davidsz. de Heem’s circle. His son, Jan Pauwel Gillemans the Younger (1651-1704) was also a still-life painter. Very few paintings survived and the great majority of them are over laden garlands with fruits and flowers set on a neutral background. 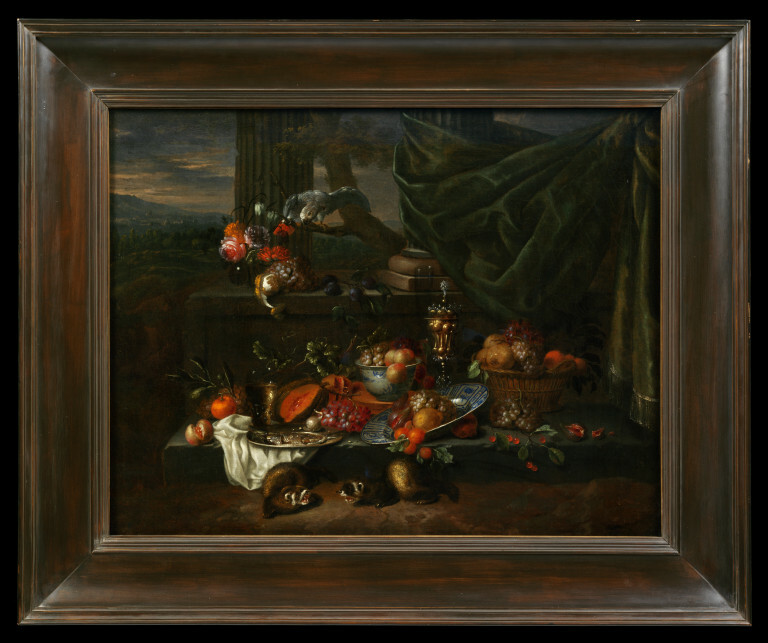 This painting appears therefore quite unusual in the output of the artist but is a good example of the ornate still-life or banquet pieces introduced in Antwerp by the Dutchman Jan Davidsz, de Heem in the late 1630s. Still-life with vessels, fruits and flowers displayed at the bottom of two columns, with a parrot and two ferrets. In the background is a landscape with a distant town in the sunset. Height: 55 cm approx., Width: 68.5 cm approx. Bequeathed by John M. Parsons, 1870. Historical significance: Very little is known about Jan Pauwel Gillemans the Elder’s life and work. Very few paintings survived and the great majority of them are dense garlands with fruits and flowers set on a neutral background, very typical of the Flemish still life tradition. 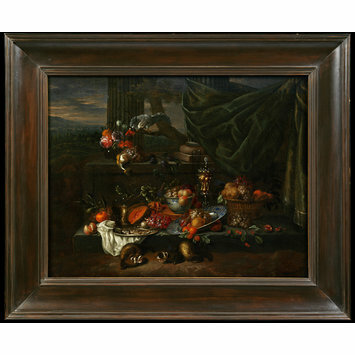 This painting is a good example of the ornate still-life or banquet pieces introduced in Antwerp by the Dutchman Jan Davidsz, de Heem in the late 1630s. In these paintings fruit and flowers often bear a symbolic meaning such as the pomegranate, which is a symbol of the Passion, or such Eucharistic symbol as grapes and wine. In this painting, the artist gathered rare and precious fruits from different seasons with valuable vessels and silverware, arranged with a remarkable play of light and a particularly beautiful colour scheme that combines golden greys with a wide range of cool colours from pink to deep purple. The setting of a still life with a landscape in the background was already en vogue as it appears in Jan Davidsz. de Heem in Pronk Still Life with Shells, dated 1642, Private collection and in Andries Benedetti’sSumptuous Still Life, Museum of Fine Arts, Budapest. This innovative thrust may partly witness the emergence of still-life painting as an independent genre when it became established alongside other newly liberated genres such as landscape. This painting appears however quite unusual in the little known output of the artist who seemed to favour compositions including garlands of flowers. Still-life reached the height of its popularity in Western Europe, especially in the Netherlands during the 17th century even though still-life subjects already existed in pre-Classical, Classical and Renaissance art. The term conventionally refers to the type of work in which an arrangement of diverse inanimate objects including fruits and shellfishes, vessels and artefacts are depicted. This new genre painting originates in the early 15th century in Flanders where Hugo van der Goes (ca.1440-1482), Hans Memling (ca.1435-1494) or Gerard David (ca.1460-1523) included in their composition refine still-life details charged with symbolic meaning, in the same manner as the illuminators from Ghent or Bruges did for decorative purpose. In the Low Countries the first types of still life to emerge were flower paintings and banquet tables by artists like Floris van Schooten (c.1585-after 1655). Soon, different traditions of still life with food items developed in Flanders and in the Netherlands, where they gain huge commercial prosperity especially in the new bourgeois art market. Dutch painters played a major role in its development, inventing many distinctive variations on the theme over the course of the century. The style set by Snyders's Rubensian banquet pieces was developed in Antwerp by the Dutchman Jan Davidsz. de Heem (1606-1684), and it was a major element in the formation of the opulent baroque confections of fruit, flowers, and precious vessels that became a standardized decorative type throughout Europe. Scholarly opinions had long been divided over how all of these images should be understood. They manifestly witnessed the prosperous growth of wealthy cities such as Amsterdam and Haarlem but also may be envisaged asmemento mori, or vanitas i.e. reminding pictures of the human mortality and invitation to a meditation upon the passage of time. These pieces were still popular in the 18th century, especially the fruit and flowers ones. Kauffmann, C.M., Catalogue of Foreign Paintings, I. Before 1800. London: Victoria and Albert Museum, 1973, p. 130, cat. no. 149.